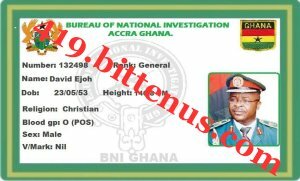 I AM GENERAL DAVID EJOH FROM THE BUREAU OF NATIONAL INVESTIGATION HERE IN REPUBLIC OF GHANA. THIS AFTERNOON,WE APPREHENDED 9 INTERNET SCAMMERS AT THE GLOBAL-LINK INTERNET CAFE HERE IN ACCRA,IMMEDIATE THE BOYS SAW US THEY STARTED RUNNING,SO FAR SO GOOD,WE WERE ABLE TO APPREHEND 9 OF THE SCAMMERS. ONE OF THEM WAS WRITING YOU AS A REFUGEE,4 OF THEM WAS IMPERSONATING WESTERN UNION OFFICE AND ANOTHER WAS IMPERSONATING UBA BANK AND INTERCONTINENTAL BANK,ONE WAS WRITING TO ANOTHER FOREIGN BENEFICIARY AS A BARRISTER,ANOTHER WAS IMPERSONATING THE DHL EXPRESS DELIVERY AND THE LAST ONE WAS IMPERSONATING THE ECO BANK BANK. AFTER MUCH CONFIRMATION OF THE VERIFICATION OF YOUR TRANSACTION HERE IN GHANA,STATISTICS HAVE SHOWN THAT 90% OF THE PEOPLE YOU ARE TRANSACTING WITH HERE IN GHANA ARE SCAMMERS. WE HAVE FOUND OUT THAT THERE ARE A LOT OF SCAMMERS BARRISTERS,WESTERN UNION,MONEY GRAM,IMPOSTORS BANKS AND EVEN GROAN UP MEN THAT ARE CALLING FOREIGN BENEFICIARIES AS A SON ALL IN THE NAME TO SCAM MONEY FROM GOOD FOREIGN BENEFICIARY LIKE YOU. YOU ARE ADVISED FOR YOUR OWN BENEFIT TO START FORWARDING ALL THE EMAILS THAT YOU RECEIVE FROM GHANA TO ME SO THAT I MAKE SURE THOSE SCARMERS ARE PUT BEHIND BARS AND TO PROTECT YOU AGAINST ANY SCAM TRICK. I WANT TO USE THIS MEDIUM TO INFORM YOU THAT IF THERE ARE ANY VERIFICATION YOU WANT TO CARRY ON, YOU CAN CONTACT ME ON MY PHONE OR BY FORWARDING TO ME THE EMAIL SO THAT I CAN VERIFY THEM FOR YOU OR IF YOU NEED THE VERIFICATION TO BE DONE SECRETLY,THAT IS MY AREA OF SPECIALIZATION. I NOW LOOK FORWARD TO YOUR POSITIVE RESPOND REGARDING THIS MATTER AS WE HOPE FOR A BETTER GHANA CAPABLE ATTENTION TO ALL YOUR TRANSACTION.